It’s everywhere, and it drives me crazy. Katy Lindemann, a friend of mine who’s a communications strategist in London, made an interesting point about the growth of this approach in a recent blogpost. Too often, she says, companies simply decide to let their standards slide when it comes to social media, opting to drop their usual voice for one that I call hypercasual. She refers to one example noticed by U.K. developer Phil Gyford. He spotted that his bank, Smile.co.uk was polling web users on a topic that felt oddly casual. I’m not entirely sure when this extremely casual voice started being used by companies online, but I remember when it seemed novel: back when Flickr (s yhoo) launched, for example, using a playful, personal voice that seemed like a breath of fresh air. It wasn’t pretending to be a person, exactly, but it had a personality. In Britain, we had Innocent Drinks, a company that has spent the last decade making a virtue of its cute copywriting. Through the Web 2.0 boom, the friendly voice was rapidly copied. In fact, it became synonymous with social media presence — even though it was rarely done as well as those who led the way. Now it feels as if everything is trying to be friendly, from fashion outlets to banks to your kid’s school. It’s partly the Innocentification of cutesy, zany copy where it’s just not plausible or appropriate for the brand… But it’s also suggestive of a complete lack of content strategy… Of not really understanding what kind of relationship the people they’re trying to engage want to have with their brand. Whether they want a brand to be useful, helpful and deliver against their brand promise – or whether they want a brand to be their mate. The question of tone is important because sometimes the hypercasual approach ends up not simply being inappropriate, but downright offensive. Remember when Kenneth Cole made an inappropriate joke during the Egyptian uprising? Or when Microsoft (s msft) urged people to buy Amy Winehouse downloads just hours after the singer was found dead? There are dozens of examples of companies getting it wrong in social media. And while some of these problems are individual failings — giving the wrong person the ability to post messages on your company’s behalf, or posting to a company account when they mean to post to a personal one — they are all, on a broader scale, the result of trying to take a hypercasual approach. The discussion reminded me of a recent New York Times (s nyt) piece arguing that the late novelist David Foster Wallace was really the man to blame for over-casual. In the article, writer Maud Newton argues that Wallace’s popularity was emblematic of the language that evolved from the web; the equivocations, the postmodern inflections of IIRC and IMHO. I suppose it made sense, when blogging was new, that there was some confusion about voice. Was a blog more like writing or more like speech? Soon it became a contrived and shambling hybrid of the two. The “sort ofs” and “reallys” and “ums” and “you knows” that we use in conversation were codified as the central connectors in the blogger lexicon… It’s fascinating and dreadful in hindsight to realize how quickly these conventions took hold and how widely they spread. When the hypercasual is used properly, it can be very powerful. Betfair, a British gambling website, started experimenting with a new Twitter voice earlier this year. The result was a riotous stream of consciousness, jokes about corporate life or tales of dogs and strippers. It was the manic, unbalanced voice of somebody on the verge of madness, trying to escape office life through the magic portal of Twitter. It was great. So perhaps these clunky examples of the hypercasual voice — the A-Team polls and the bad taste jokes — are actually part of a strategy. It’s just a strategy that has gone wrong. More likely, I suspect, they are merely evidence that many people companies confuse being friendly with being flippant. Trying to “do social” means trying to be friendly, which in turns means sounding like an ordinary person — and it’s very easy to imagine that the best way of sounding like an ordinary person is to simply let an ordinary person take over your Twitter account and do whatever comes to mind. But thinking that hypercasual is synonymous with not trying is a terrible mistake. David Foster Wallace didn’t just write the first thing that came into his head; he agonized over the text. 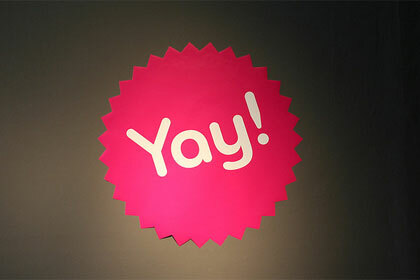 Flickr’s playfulness with words represents something of the company’s culture, even now that it’s part of Yahoo. Lots of businesses want to be friendlier, but that doesn’t mean you can just slap up a few jokes and I’ll be your lifelong buddy. The truth is, I don’t want brands to tell me what they were doing this weekend or share funny video mashups with me. That’s what my real friends — what real people — are for. I really get your vibe here man, like totally. I think the article hits the nail on the head that good social media marketing takes planning. You can be a real person and still be professional, convey personality and whimsy without being insincere or too chummy. But you do have to decide what business voice you’re going to have – what will resonate best with your prospects and clients – and then keep to that voice. Point taken and hits perhaps a bit too close to home. My website (*the* actual business) has some playful language. It is extremely content-dense, so we try to add a bit of whimsy on occasion. I also post three forms of entertainment each day on our FB account, including many cute kitten videos. This is almost all we do with that account, and the exposure we receive hardly justifies that effort, but I *like* most of the posts with my personal account to share with my circle, something I would be doing anyway. The entertainment postings aren’t in addition to other marketing efforts on that FB account, it is a soft sell awareness-building. The hope is that if the quality of the postings is superior to other sources/compilations, more and more ppl will join their friends and then curiosity will get them to check us out. There are subjects such as the one above that could effectively be covered in one, at most two paragraphs. If one-tenth of the energy and verbiage that is wasted on trivialities on the internet would be re-routed to e-mailing Senators and Congressmen about the plight of our country, it may actually do some good. It used to be novel, as you said, but I think this is a great example of how social media, or new media, is just becoming another media. Consumers who aren’t idiots anymore (you’d have thought they’d know this by now) see right through the cosy, casual chatter and see it for what it is – blatant marketing crap. It’s a fine line – just like any other media – and it takes the right voice, the right strategy and the right attitude. just what kind of business sites do you go to? Why would you go to see their facebook page at all? As for banks, I go to their main site to check my account. Other than that, I have no contact with them. Aren’t there better things to do? I’m not crazy about this new valley-girl voice that so many businesses are starting to take on. The voice of the company should not be determined by the tools available. Brand is a real thing. I want my marketing company to sound like Mad Men’s Don Draper and he doesn’t say everything that pops into his head. I want my bank to sound like the AIG guy and he talks business. I want Apple to have an air of mystery and that doesn’t mean they have the voice of a chatty kid brother. Companies can find a meaningful voice in the silences. Pregnant pauses add gravitas. You respect the quiet old man who only speaks when he’s got something to say. That’s the guy who I want as a doctor and banker. It might be true that the “woot” factor is a bit disturbing and overpersonal, but on some level it’s nice to feel like your bank have a soul and an opinion on the A-Team. Perhaps it instills more trust. I think that’s the question… when does it feel appropriate, versus when it feels forced. Personally I want to feel like my bank is friendly enough but I’m not comfortable with it being too chummy: they’re dealing with my money — we’re not going out on a date. I’m sorry, but I do not believe that your bank has a soul, although perhaps your credit union might? Your bank has a marketing department, and their job is to make you think these kind of things. If anybody thinks that a “woot” factor instills more trust in a company, they need to wake up and take a closer look at what the banking industry has done these past years. I believe that the “vampire squid” from a few years ago better describes the “soul” of most large commercial banks.